Looking for new career opportunities? Are you eager to make meaningful connections and expand your contacts? The best place to meet industry professionals is networking events. Unlike following someone’s profile online, meeting in person leaves a remarkable impression about whom you are in the professional world. At Employment Solutions, our temp agency employment specialists strongly recommend attending meet-and-greet events if you are in search of temp employment or a long-term position in order to “get your foot in the door” prior to sending in a blind resume. Every person has the potential to provide you with a job lead. 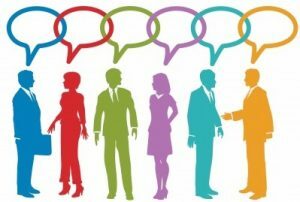 While it may be difficult to discover a suitable job opening during conversations with family members and friends, the value of the “word-of-mouth” present at a network event is immeasurable. Before you approach anyone, you must be prepared to sell yourself in tactful manner as anyone may have information about an upcoming or current job opening. A large percentage of those attending networking events will be in high positions within the company for which they are employed. Typically, you will meet employees from management and/or human resources departments. If you are seeking employment, these are the individuals that hold the power to influence the decision to hire you. Yet, this is not an interview, so avoid being pushy or reciting your resume. Be social while remaining professional. Focus on showing your personable side and speak intelligently about the topic at hand. When the opportunity arises, refer the conversation to a work-related occurrence related to the discussion instead of a personal experience. Remain patient and wait for the ideal moment to interject yourself into the conversation. Names can be difficult to remember, so be sure to bring a business card and ask for a business card. Arrive with a stack of modern business cards in your pocket to handout after a conversation has ended or the event is coming to a close. Also, making connections means keeping those connections, which can be a tough task if you cannot recall a person’s name or contact information. Therefore, inquire as to whether an interesting connection has a business card if one is not offered or exchanged. If you reside in or around Denver, CO, the employment experts of Employment Solutions can provide you with many helpful tips on how to network, find your dream job and secure temp employment. To gain indispensable assistance with your job search, contact Employment Solutions today to schedule an appointment at (877) 880-4473!